Toucans wander through the forests and adjacent clearings in small family groups and flocks; such flocks rarely consist of more than twelve birds. 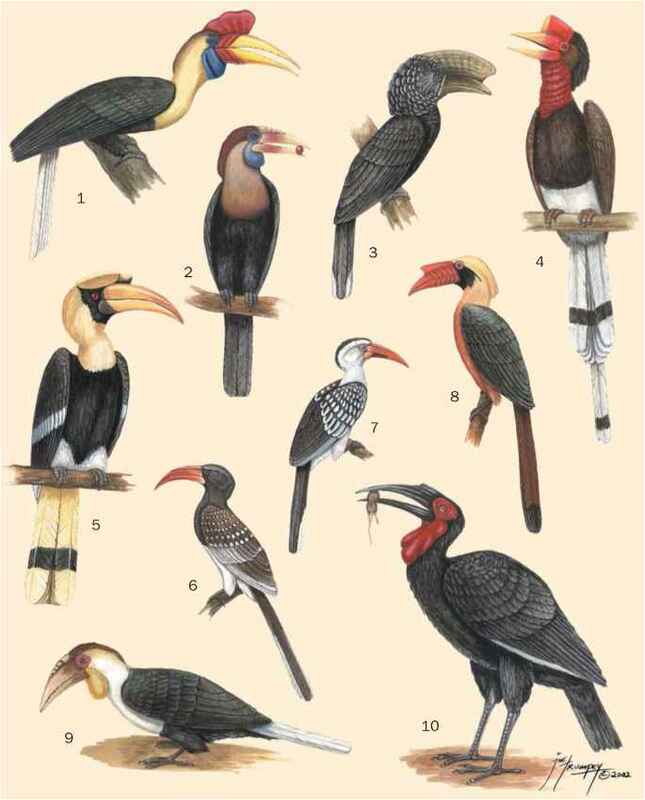 Toucans are not intensely sociable; they never take flight in a tight group, but instead wander about in loose groups. 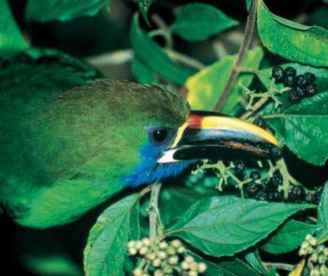 The agile aracaris fly swiftly and in a straight line; large toucans are poor fliers. After beating their wings a few times, they hold them out and glide downward, as if pulled down by the weight of their large bills. Then they begin to beat their wings again. The flight, as a result, is both undulating and brief. Toucans preen one another, particularly on the head and nape, with the tip of the bill. When sleeping, toucans lay the bill up over the back, and tip up the tail, forming a roof over the back and bill. One can see how advantageous such a "feather ball" is to the aracaris, which sometimes sleep five or six together in an old woodpecker tree hole or in rotted hollow tree trunks; the last bird to squeeze in enters the hole backwards, with its tail laid over its back. Toucans utter melodious calls many times in the late afternoon, continuing when most other birds have gone to rest, but are inactive at night. They also vocalize more during morning hours, and after rains. They prefer to remain high in trees, even bathing in the rainwater pools that form in the fork of a tree or on a thick horizontal branch. Although many species have ranges that overlap, D. Brooks found that species living in the same region have bills of different lengths and take different prey, thus avoiding competition. The only case of competitive exclusion where two similar-sized species coexist involves pale-billed aracaris (Pteroglossus flavirostris), a species that is restricted to the forest canopy in the Peruvian Amazon by chestnut-eared aracaris (Pteroglossus castanotis), which occupy forest edge almost exclusively. Competitive exclusion is assumed because pale-billed aracaris in Venezuela will use edge forest, not just forest canopy, in the absence of chestnut-eared aracaris; meanwhile chestnut-eared aracaris in Paraguay, where there are no pale-billed aracaris, remain in forest-edge habitat. Most toucan species are year-round residents in their home range but montane species may undergo seasonal altitudinal migrations, moving downslope in fall and upslope in spring. For some lowland species there are records of huge flocks invading areas with fruiting trees after the breeding season, when fruits become scarce.